I wanted to go to a warehouse in the midsouth of downtown Danville to get some of my belongings out of storage. A masculine voiceless Voice with me silently spoke, telling me not to go through the business section of downtown Danville, but to "go around" near the edge of the city, through the southeastern corner which ran by the cemetery beside the VA (וא), to get to the warehouse. The voiceless Voice warned me of a Nazi gathering happening in downtown Danville and provided me with an alternate route to go to get to my belongings. I immediately knew the essential and specific content of his transmitted communication without the need of any words to articulate the message. The words which describe the content of the message are my words. As the voiceless Voice was silently speaking my traveling instructions, I saw giant living forms set in an "encircling line" at periodic distances like sentinels, facing away from me, looking out, like solid dark shadows against the dusk (a liminal crossroads) of the horizon. They were looking out over the land as if guarding me. The living forms reminded me of the giant stones of Easter Island, except those in my vision were not of stone but were dark living creatures. The living forms were also completely bodied, not just heads of stone. Though generally sitting rooted directly upon the ground, they were able to get up and walk an encircling patrol. I saw one rise from a sitting position and walk its circle. The positions of the living creatures reminded me of electron orbits, where each sentinel was like an orbiting electron - I saw the creature as a particle when I focused to see it, but it also existed as a protective wave within the entire orbit of its place. When I relaxed my focus, like Yitzchak, I saw the one I was observing "get up and walk" its orbit. 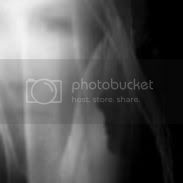 The living creatures also communicated to my mind in the dream that they functioned as signaling agents - like when sending messages by smoke signals, signalers are stationed at periodic distances from one another at each edge of one complete circle of horizon to the next. The living creatures could communicate danger or other information to one another from one section of the land to the others. They and I were all connected like one huge protective network, communicating telepathically and simultaneously one to each other. I too, was part of the network of sentinels and warned the others of the Nazi gathering, even as I simultaneously moved away from the Nazi gathering, going toward the place where some of my belongings were being stored. The dream shapeshifted, communicating other information to me. After that, I woke up. This dream follows my Hebrew letter tarot reading of last night, as described in Circuits Of Fire. Motzi Shabbat Hebrew letter tarot reading performed under the waning gibbous moon 65% full during the planetary hour of the moon. I still love my long black skirts, but spring is arrived, and with it has arrived a taste for color in artful witchy designs. Consequently, I'm adding some dangerously divine clothing items to my wardrobe as shown on Craftwork Of A Jewitch. Many of the unique witchwear items I have purchased for myself and feature on my blog can be purchased by other witches (see my new witchwear links section on Craftwork Of A Jewitch). If you like these witchy designs and would like to choose something similar for yourself, visit my witchwear links. My sixth grandchild, my first granddaughter, Gwenn, arrived in this world at 7:01 pm April 22, weighing in at 8.0 pounds, 21.5 inches long, perfect in every way. In follow up to Transformative Pesach Prophecy, several elucidating ideas emerge from Ceridwen's cauldron of transformative prophecy. Pesach Sheni is May 19 (Iyar 14, corresponding to the time we count the 30th day of the Omer) and astrological Beltaine (Beltaine Sheni) is May 4 (Annwyn 30) this year of 5768. Consequently, both Pesach Sheni and Beltaine Sheni come together through a "time" value of 30. Ceridwen is associated in Celtic witchcraft with Beltaine. Yet, Ceridwen delivered to me a prophecy associated with Pesach. Taken together, Ceridwen represents for me stepping above the time of both, transcendently joining together Pesach and Beltaine. As a lunar goddess, Ceridwen is linked with blessings bestowed through Yesod into Malchut. Pesach Rishon this year is April 20 (Nissan 15). The full moon of the witches' month of Annwyn is called the Drawing Down The Moon full moon, also on April 20 (Annwyn 16), suggesting a time through which the redemptive blessings are bestowed is April 20, which is the date of both Pesach Rishon and the Drawing Down full moon of Annwyn. The blessings bestowed from Ceridwen's cauldron are redemptive, drawn down from the powerful full moon which marks redemption from Mitzrayim, which is Pesach in Jewish tradition. In Celtic tradition, six sacred grains of spellcraft were brewed as a grael in Ceridwen's cauldron. In terms of middot (measures), 6 grains = 388.79346 milligrams. 388 is the gematria of למשיח meaning "belonging to Mashiach"
79346 represents the five letters ודגטז, where five identifies the Divine Feminine of both Binah and Malchut. The five letters have a combined gematria of 29 - the same gematria as a Torah word used in Bereshit 48:16 to bestow blessing upon both children of Yosef, namely וידגו meaning "and let them grow". And Yisrael blessed them saying, "let my name be named in them, and the name of my fathers Abraham and Isaac; and let them grow into a multitude in the midst of the earth." Taken together, Ceridwen's cauldron contains and "bestows the receptive" blessing "belonging to Mashiach" and "of Yisrael", suggesting that Ceridwen is the unified feminine archetype corresponding to masculine Yisrael. Importantly, Ceridwen represents she who bestows the blessing which ignites messianic consciousness, causing it to grow into a multitude in the midst of the earth, as waters cover the sea. Within the letter-sets of both blessings are the letters of the sha'ar (gate) דג, implying quick multiplication in great numbers. The word וידגו (of Yisrael's blessing) begins with the letter ו, with a value of six, like the six grains of spellcraft brewed in Ceridwen's cauldron. Similarly, the letter-set ודגטז (of Ceridwen's blessing) also begins the the letter ו. Yet differently, the word of Yisrael's blessing ends with a ו (the letter of connection) while the letter-set of Ceridwen's blessing ends with a ז (the letter of selection). Thus, Ceridwen's blessing represents the extension of Yisrael's blessing into manifest reality. Also, his blessing contains the letter י (a letter of projective energy, שפע), while her blessing contains the letter ט (a letter of receptive energy, קבל). Ceridwen (Boudicca) and Yisrael (Yaakov) are parallel quantum coarse grains (one primarily an involutionary stream and one primarily an evolutionary stream of consciousness), who together, decohere consciousness into manifest history as described in my poem Coarse Grained Histories, Dialog With The Divine. I woke up in the middle of the night last night with a vision imprinted upon my mind. In the vision, I was sitting at my office desk working on all the extra work that has been put upon me recently (which, by the way, I am successfully making my way through this immense sea of work). Ceridwen, the archetypal Celtic goddess of prophecy and transformation, walked through the doorway into my office. She had a look of controlled anger about her, as if she was restraining herself mightily against some injustice. 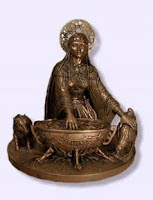 She also had a halo, like the one she wears in my bronze statue of her cauldron and she (shown, click to enlarge). With Ceridwen's appearance, came the words "warning" and "the writers" (ה-כותבים). The two messages were one essential communication, each message corresponding to the communication on a different perceptual level. "Warning" was telepathic and completely encompassing and encircling, like Ceridwen's halo. It was non-local, yet focused sufficiently to be perceived by me. It was sufficient. It was enough. It was Divine Justice (Tzedek, Yesod, Shaddai). The word "warning" contained that sent forth into the world to deliver justice. "The writers" was spoken telepathically through the archetypal goddess herself. Archetypes are matrices of Beriyah. Beriyah is the universe of discernment, distinction and the letter ה (the letter written in red upon the doorways of the Hebrews in Mitzrayim, and a prefix meaning "the"). Ceridwen, as the archetypal Celtic goddess of prophetic writing, is an archetypal "shoresh" (root) of all writers. Thus, Ceridwen, the root of all writers, spoke like an Elohim of writers, her words "the writers" writing the letter ה upon my doorway(s) as she entered. She was The Writer in my vision. As well as being the goddess archetype of all prophetic writing, Ceridwen is a goddess archetype of transformation. "Writers" comes from the Hebrew shoresh כתב, meaning "to write" and "to record". A phonetic cognate of כתב is קטב, meaning "killing" and to "die suddenly". The firstborn of Mitzrayim died suddenly, receiving the root קטב as opposed to the root כתב. In my vision, כתב came with a ה. The firstborn who were killed in Mitzrayim had no ה. Thus, Ceridwen transformed קטב (shoresh of "killing") into כתב (shoresh of "writers"), attached a ה, and spoke to me this written message of deliverance. This morning, Illinois experienced a predawn magnitude 5.2 earthquake. In Mount Carmel, Illinois, "a porch collapsed, briefly trapping a woman in her home." CNN reports "she wasn't hurt and was freed quickly." Interesting Mount Carmel connection to Eliyahu, another prophetic archetype. Two messages of one essential communication. Two prophetic archetypes delivering one essential communication. Pesach 5768. Out Of The Broom Closet. I openly wore a pentacle at work today. Later, having dinner this evening with my parents, my father came right out and asked me between bites, "Are you studying to be a witch?" "Actually, I am, " I said, "I'm a Jewish witch. A kabbalist, a shaman ..."
"What's that?" my father asked regarding the latter descriptor. "You know ... a mystic ..."
"Oh, you mean, a witch," he said with a small chuckle, then the conversation went on to other topics. My children have all known for quite some time now that I am a Jewitch. But, I've never actually straight up informed my parents of my interest in combining witchcraft with Judaism. I am totally out of the broom closet! I have indeed been liberated this Pesach. A potent message the Scorpion chooses to express is that of protection and/or isolation. In fact, they themselves are quite solitary - part of the reason why they symbolize the solitary. Read full article on the wonders of the scorpion at link above. Encoding critical actions to Divine Consciousness, as described more explicitly in The Epiphany, turned inside out, שיד is the Divine Name שדי. Note that all three letters have a kotz (thorn, spike). Googling "dilug" for some clue as to the significance of the quantum jump in consciousness I experienced during dinner Monday (see Dilug At Dinner), I found an interesting connection of my "dilug" (which was a quantized as opposed to a gradual energetic increase) to the observance of Pesach. See the muga maamor Lehavin Inyan Pesach Sheni, 5738, 2nd paragraph of ois beis. According to this it is possible to connect the explanation above that Pesach Sheni is a higher level, which comes after the preparation of the avodah of Pesach Rishon, with the inyan that Pesach Sheni as it is b'pashtus, that it is a tikkun and hashlama for someone that didn't bring a korban Pesach. Because this that Pesach Sheni fixes and repays the lack that resulted from not bringing a korban Pesach comes from the gilui of Pesach Sheni which is a dilug sh'lo b'hadraga, and it has no measures or limitations, not even the measures and limitations of Pesach (Rishon), and through this gilui -- "iz nita kein farfallen." The phrase dilug sh'lo b'hadraga in this discussion of Pesach Sheni refers to a jump of not a gradual nature but rather, is of a quantum nature (all at once)! like what I experienced Monday at dinner. I understand the meaning of kein farfallen to be something to the effect of "not doomed", "not fallen", "not collapsed", "not hopeless", "not a lost cause", etc. Iz nita means "there is none here". Thus, one interpretation of iz nita kein farfallen is "there is no one doomed here". Yesterday, as I was eating dinner, for a few simple startling moments in time, a strange alteration of consciousness silently occurred. No one noticed, but I definitely felt it. For those few moments between bites of food, even as others were conversing, the entire psycho-physical world "jumped" to a higher state of being, feeling less dense, as if gravity had decreased it's pull on materiality, and "brighter", as if the fabric of all spacetime was crisper, clearer and without obstruction. Even my physical body felt as if it had the strength and lightness of a small child, full of easy vigor. My consciousness settled back after the initial "grand" jump into a higher energy level than before the jump had happened - sort of like a few steps forward and one step back, with a net gain. This experience of consciousness felt to me like an electron must feel when it jumps from from one quantum energy level to another - that is how it felt - quantum in nature. I've stepped up into different Universe with that jump. Everything has changed. It's a new ballgame. In follow-up to my Craftwork entry, Another Like Me, I've found a word to describe the kind of witchy-friend I am looking for - a reyah (רֵעַ) meaning a "close friend" of the same soul-stuff. Given the complexity of my soul, such a witchy companion may be hard to find around here. But, I can't, won't believe that no other like me exists. Somewhere out there is a reyah for me. Interestingly, in follow up to both Michael And Me and Muvhak, there is precedent for the malach Michael "coming down" to a female. It is to Asnat, the daughter of Dinah and the granddaughter of Yaakov. Somewhat similarly, Michael "came down" to me. Also interesting within the midrashic account, is the information that Dinah, Asnat's mother, was six years old when she was "kidnapped". I was six years old when I experienced the epiphany, and briefly "escaped" mitzrayim (katnut consciousness). LONGMONT, Colo. — A skydiving instructor and his student died Saturday after a fall while doing a tandem jump over Vance Brand Municipal Airport, airport manager Tim Barth said. "Everything was normal. The parachute was fine," said Barth, who went to the scene after the accident. Barth said that about 100 feet from the ground, the instructor made a turn to land, with the wind behind him. About 50 feet from the ground, he made another turn but was going too fast and was too steep, Barth said. LOS ANGELES, California (AP) -- Charlton Heston, who won the 1959 best actor Oscar as the chariot-racing "Ben-Hur" and portrayed Moses, Michelangelo, El Cid and other figures in movie epics of the '50s and '60s, has died. He was 84.